We were honored to photograph this brave, determined, persistent and passionate woman. Monica is one of a kind, she has a zest for life and optimism that is unparalled. You can view more images from her session here in her gallery on our website. She was an absolute HAM in front the the camera, most photographers are not very comfortable in front of the camera, but she hammed it up with lots of poses allowing us to photograph her many facets. Monica survived cancer Hodgkins when she was 24 and has had a very full life with a wonderful husband and a great daughter who is also her friend and her companion. She is now battling breast cancer and we were honored to be able to document both her strength duirng this time and the ravages of the cancer. Her relationship with her daughter reminds me of me and my Mom. Monica has a great smile, a wonderful sense of humor, and oozes with passion. 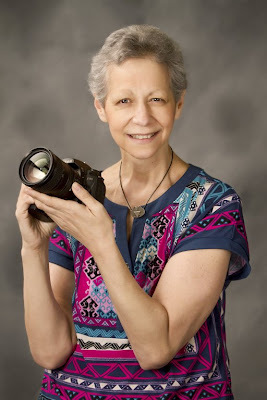 She is an award winning photographer and is very involved in photographry organizations such as the Milford Camera Club. This is my impression of Monica -- that she has certainly accomplished this goal many times over! "The goal for mankind is to walk a path on which our souls will shine and sparkle as brightly as diamonds." She says this about her photography: "an insatiable wildlife and travel photographer, captures beauty, color, spirit (and often humor) into all of her images"
"The Jewish word "Besheret " translates in English to soul mate, destiny, or "meant to be." I have always felt that in life there are few "coincidences" and that things happen for a reason, even bad things. So after surviving Hodgkin's disease at the age of 24 and then being diagnosed with breast cancer in 2003, my "besheret" became clearer to me than ever. Photography had always been my passion and I knew that the time had finally come for me to leave my teaching career, take huge risks and pursue a new path with wild abandon. Life threatening illnesses have a way of making you reach way down into your soul, see who you are and discover what really makes you happy."